Bartley products are intermixable, so you can match existing colors as closely as possible, or create a finish exclusively yours. Plus, all our products are non-toxic (after proper drying time) polyurethane based, making them resistant to marring, alcohol and water. They dry in a few hours, allowing you to complete your finishing project in hours, not days. These products have an indefinite shelf life and can be stored and used on furniture pieces or wood rim. Our clear coat finish is non-toxic and can be applied on household eating utensils. 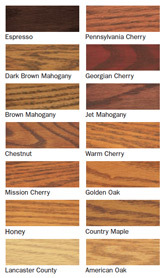 If you want a tough, close to the wood finish, goof-proof application, use or Bartley finishing products. Bartley Gel Wipe-On Finishes are easy to use with no messy runs or drips, and require no sanding between coats. And they are multi-purpose and excellent for Staining Fiberglass Doors, Woodgraining, Antiquing, Glazing, and Sponging. Try intermixing them with another color to create your own custom look, or simply topcoat it on to another stain. Try one of our Bartley products and discover why it is acclaimed by professionals and amateurs everywhere. Here is a sampling of some of our premixed colors. Print our PDF brochure on a photo-quality printer for better color reproduction.